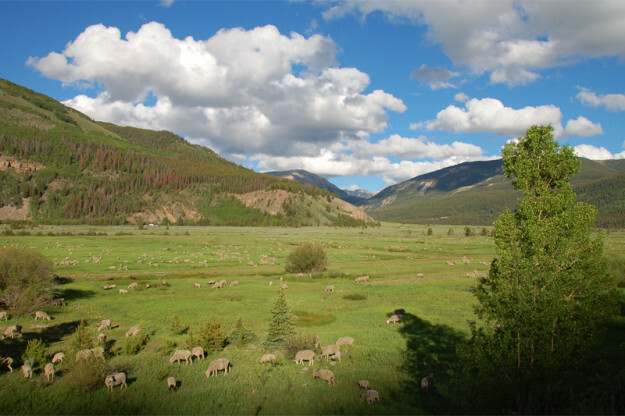 Sheep near Bolts Lake on the proposed Battle Mountain Resort near Minturn (photo courtesy of Battle Mountain Resort). A large proposed land swap between a private developer and the U.S. Forest Service near Vail and Beaver Creek ski areas has rekindled the always-smoldering debate over what constitutes the “best public interest” on federally owned public lands in Colorado. More than 36 percent of Colorado is owned by the federal government and managed under a multiple-use policy that allows for everything from outdoor recreation to timber harvesting to cattle grazing, mining and oil and gas drilling. Outright housing development is not on the list. To accomplish its concept of a high-end resort development with 1,700 homes and a private ski area, Battle Mountain Resort in Minturn wants to swap 5,457 acres of more remote, privately owned land for 4,700 acres of Forest Service land at Meadow Mountain, which is right along the Interstate 70 corridor near the town of Minturn. Battle Mountain proposes developing 1,274 acres of the Meadow Mountain parcel while maintaining the vast majority of the land as open space for public use. Meadow Mountain used to be a small ski area owned by Vail before it was conveyed to the Forest Service, and Vail’s founders once eyed it as a possible ski connection between Vail and Beaver Creek. Now the land is heavily utilized by hikers, bikers and cross-country skiers, as well as a wide variety of wildlife, but some Minturn residents still dream of a ski-area connection. White River National Forest Supervisor Scott Fitzwilliams says that while the Forest Service does like to congregate more remote parcels in the midst of large tracts of public land, especially so close to major wilderness areas, the agency also puts a high value on what he calls “backyard forests.” In other words, public lands near major population areas that are easily accessed. Originally proposed for development last decade by Florida golf resort developer Bobby Ginn, the controversial Battle Mountain parcel was cobbled together over many years from old mining claims and other private parcels and purchased by Ginn and Philadelphia-based private equity firm Lubert-Adler for $32.75 million in 2004. The subsequent subprime mortgage crash of 2008 forced Ginn out in 2009 and left Lubert-Adler in full control of a property that originally was approved for two private golf courses, up to 10 private ski lifts and significant retail space. The new “more Colorado, less Florida” plan scraps the golf courses and retail and reduces to the number of ski lifts to three or four. Battle Mountain Resort spokesman Cliff Thompson says the company is in the very early stages of submitting its land-swap proposal, including addressing several concerns voiced by Minturn officials, and that he couldn’t yet characterize what kind of public input they’ve received. He did say, however, that the company would encourage continued public access at Meadow Mountain. Fitzwilliams says Vail Resorts does not appear to have any interest in connecting either of its two local ski resorts – both located on leased federal land – to the proposed private ski area or to each other. Fitzwilliams also says his agency won’t consider the viability and accessibility of Meadow Mountain’s real estate potential in determining whether the swap is in the public interest and worth pursuing further. Of course, one man’s public interest may very well be another man’s private gain, and the debate over who knows how best to manage public lands for the greater good has spilled over into the halls of Congress at both the federal and state level in recent years. Some state lawmakers and candidates, primarily Republicans, claim they have a better handle on what types of uses are appropriate on federal lands within their state, county and municipal boundaries. Republican state Sen. Randy Baumgardner, whose district includes an economically critical but endangered coal mine on federal land near Craig, says the state often gets the shaft when it comes to determining the best possible uses for public lands. “It doesn’t seem like [state officials] have a say,” Baumgardner said. “It seems like every time the state tries to become more involved with what’s going on we get shut down by the federal government.” He laments the failure of a bill he co-sponsored (SB232) last session to study the transfer of Colorado’s public lands from federal to state control. Another failed bill (SB39) did directly propose joint state-federal jurisdiction over public lands, and conservation groups opposed it out of concern over the potential for increased development. But Baumgardner argues greater state and local control at least needs to be studied. Democratic state Sen. Kerry Donovan, whose district includes the proposed Battle Mountain-Meadow Mountain land swap, ran on a platform last fall that called for maintaining the status quo with regard to how federal public lands are managed in Colorado. However, she helped run a successful bipartisan bill (HB1225) in the Senate that provides state funding and expertise to towns and counties looking to have greater input on federal land-use decisions that impact local communities. Administered by the state departments of Natural Resources, Local Affairs, and Agriculture, the program is funded by the state’s Mineral Impact Fund and Severance Tax Fund. Grant application information is now available on the DOLA website. Donovan says the bill allows rural counties that don’t necessarily have the staff or resources to get help from the state drafting land-use plans in the language and format that federal officials need in order to take local concerns into consideration. “It definitely is a tool that’s meant to help local communities make sure that their voice is heard when it comes to federal lands decisions, but it wasn’t a direct defensive response to the public lands debate that gained momentum in the session this year,” she said. And it’s more of a proactive than reactive tool, Donovan adds – one that’s intended for long-term land-using planning rather than responding to something like a land swap or coal-mine shutdown. Donovan says she has been approached by the Battle Mountain developers but has not studied the proposal enough to take a position on it.